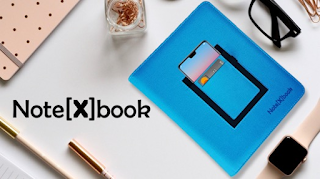 28th March 2019, Austria / — Note[x]book is not just a notebook, it also contains a Goals and ToDo Manager. And you can refill it individually. What makes Note[x]book unique is not only that it is refillable. You can put your smartphone, your wallet, your cards and your pen in it. It's so cool. You will love it. Note[x]book will help you to improve your life. 80% of us are stressed out because we cannot manage our time. We want to work more effectively but we often don't know where to start and we often lose track. Note[x]book will change this. It's very easy to handle – in 3 steps. Define your goals and write down what you must do to achieve your goals. Give your goal a start date and a deadline. Don't wait! Work for your goals. Define, what your daily ToDos are. Do not give up and complete your tasks without a gap for 40 days. That's where Jerry Seinfeld's productivity tip "Don't Break the Chain" comes in. Mark every day with a Red X if you have accomplished your daily ToDos. After 40 days, you will have a red chain and you can be proud of you that you didn't break the chain. „If you wait, you only get what's coming to you, but if you get up, you get everything you want. " Take Notes and get help from your ToDo Stickers. And mark below, if you have done your daily tasks and something for your Goals. Note[x]book has some Stretch Goals and gifts for his backers if they achieve their stretch Goals. Note[x]book will be released on Kickstarter on Monday 01/04/2019. You can visit their website www.notexbook.com and sign up for the newsletter. You will also be notified when the project goes live – allowing you to benefit from the "Super Early Bird" discounts of up to -35%. A Start-Up founded this year. They have made it their goal to make working for something easier and to increase the motivation. In this regard, they will introduce a new product this year. Let yourself be surprised.